Those wondering what a hallucinogenic LSD trip is like need not actually imbibe the drug. They can spin this 1968 Grateful Dead album instead. The group, who was unhappy with how their debut turned out a year earlier, was determined to do things differently on this follow-up. The result is considered by many to be their most experimental work, and that’s saying plenty. The initial concept, somewhat inspired by The Beatles’ Sgt. Pepper’s opus, was to push the confines of an album, partially by splicing live and studio music together. Additionally, bassist Phil Lesh brought in avant-garde musician Tom Constanten on piano and “prepared electronics” to further develop the sound into oblique territory. Considering the Dead’s first record didn’t exactly light the charts on fire, this attempt to make the band even less commercially viable was brave and some might say unwise. It reportedly caused producer Dave Hassinger to leave the studio in frustration during the mixing and lost the support of Warner Brothers executive Joe Smith who signed them. On artistic terms though, it was the opposite of a sell-out and Anthem of the Sun’s more oblique sound collage (“mixed… for hallucinations” Garcia said) was a defiant move from a still nascent act that needed to prove itself. The opening “That’s It for the Other One” is a complex four part suite that shifts from dreamy psychedelia and driving rock to include strains of jazz and even classical. It’s fascinating, somewhat clumsy, but ultimately successful on its own terms to attempt something unique in under eight minutes. Pigpen’s bluesy “Alligator” (the first Dead composition partially credited to Robert Hunter) includes everything from Garcia on kazoo (perhaps not entirely necessary in retrospect) to an extended New Orleans drum break (the album introduced second drummer Mickey Hart) and evolves into a typical Dead jam with Garcia and Weir’s intertwining guitars that even reference the melody from Donovan’s “First There Is a Mountain” before the Allman Brothers Band did the same. Lyrics such as “Sun comes up blood red wind yells among the stone/All graceful instruments are known,” are impenetrable concepts from the equally puzzlingly titled “New Potato Caboose.” They exist more to create a druggy mood than mean anything in particular, but the song captures the crux of extended improvisation that would become the group’s defining characteristic. The first disc in this package includes remastered versions of both the original 1968 mix and the later, beefed up 1971 remix of the five tracks. The differences are subtle but, since the earlier one is hard to find, worth hearing. 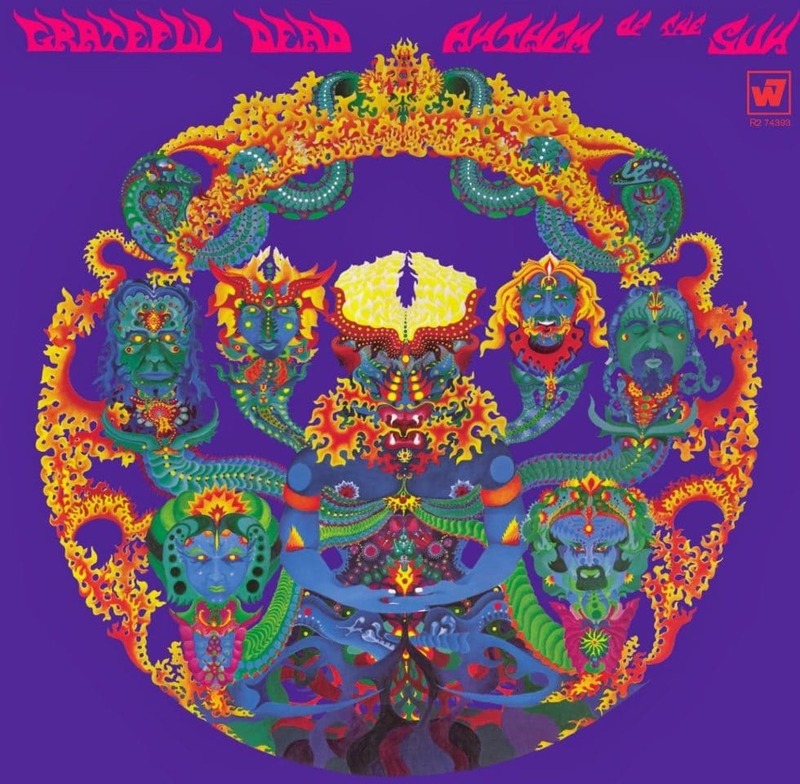 Disc two delivers a previously unreleased Winterland show from October 1967, notable for being the first recorded live set with second drummer Hart in the lineup and for previewing both “New Potato Caboose” and “That’s It for the Other One” before they were unleashed in their more unconventional studio versions. At just under an hour, it’s a little short (a hot “Turn on Your Love Light” fades out after 12 minutes) and the primitive mix pushes the vocals to one speaker. But the performance is consistently fiery, especially on Pigpen’s blues spotlights “…Love Light” and “It Hurts Me Too,” and Garcia’s prominent guitar solos are explosive. Oddly, the additional music available on 2001’s expanded single disc Anthem of the Sun, which included live takes of songs from a 1968 show along with a rare single edit of “Born Cross-Eyed,” is MIA here, even though there is room on the second platter. Regardless, this is a classy entry to the ongoing 50th anniversary Grateful Dead series and essential listening, even for those who aren’t die-hard fans. Fire up the lava lamps and let fly.